Monday 3 July – NAIDOC Week Ballina Walk – Two of our St Anne’s teachers, Fiona and Narelle, joined in Ballina’s Annual Celebration Walk along with other members of the Ballina community to celebrate NAIDOC Week and Aboriginal and Torres Strait Island culture, history, and achievements. When communities come together as one as they did for this walk, the purpose (for the walk and the celebration) is strengthened. 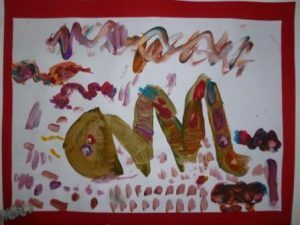 Monday 19 June 2017 – Living Safely with Dogs Preschool Program – funded by the NSW Office of Local Government – was presented to the Preschool children focusing on teaching them about dog safety. Australia has one of the highest rates of pet ownership in the world. Most dog attacks involve children in the 0-8 age range and a high number of these attacks also occur in the home environment where children are bitten by their own dog or one known to them. 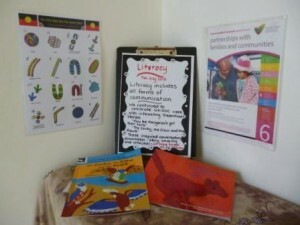 Educating children and their families ensures the child-pet relationship is not only physically and emotionally rewarding but also a safe one as well. 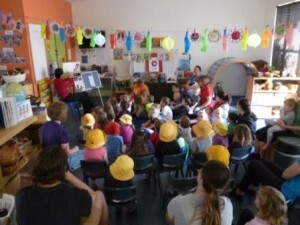 This program is delivered using role play, story, song and a “real dog” brought in by the Programme Educator to teach children: things we should not do to dogs, how can you tell if a dog is happy, scared or angry, a safe way to approach and greet a dog, and what to do if approached by an unknown or aggressive dog. 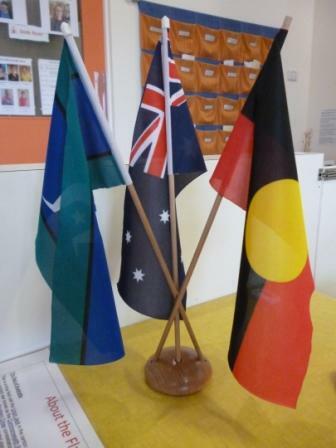 Reconciliation Week, 27 May to 3 June, Let’s Take the Next Steps” was acknowledged and celebrated at St Anne’s in a way that was meaningful to young children with educators talking to children about friendship, acceptance, getting along, respect, celebrating difference and understanding. 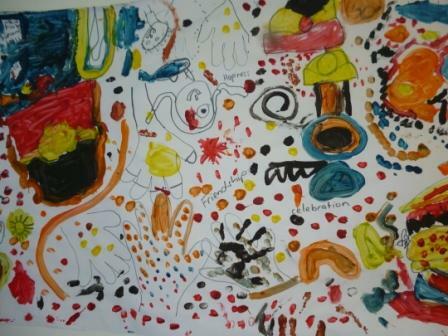 The older children worked together on collaborative artworks, read Dreamtime stories then represented them through artwork. 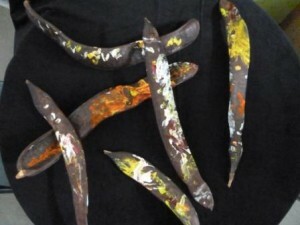 The Preschoolers also experienced a “Sharing Culture” performance by Gwenda Stanley, a member of the Young Australian Workshop Aboriginal Education Group, who shared with them dance, story, artifacts and language. 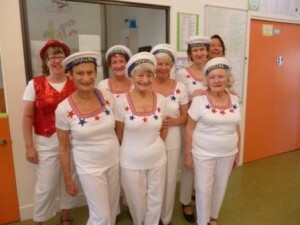 This year our Seabirds Preschool Class has made two visits to “Crowley” to sing, dance and chat with the residents in the facility’s new amazing and accommodating Entertainment Room. 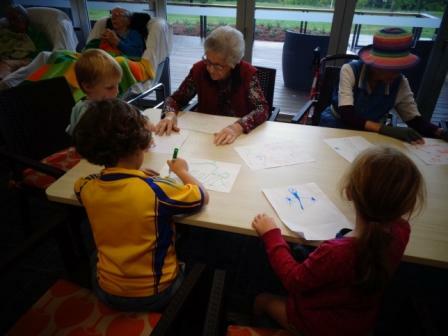 We see on these visits, the spirits of young children “lifting the spirits” of the older folk as they sing along to familiar songs such as Hokey Pokey, Little White Duck, London Bridge, Heads Shoulders Knees and Toes, and Advance Australia Fair. 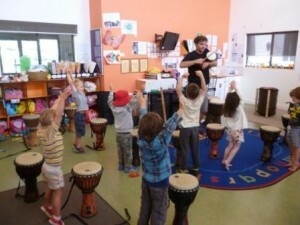 On Monday 21 September, Gareth Jones from Sound Synergy, visited St Anne’s with his collection of beautiful Djembe drums and percussion instruments, to facilitate an interactive workshop of rhythm and beat, with the Centre’s Shells Room children (2-3 year olds), Rockpools Room children (3-4 year olds) and Seabirds children (4-5 year olds). Each child, as part of a group, is able to work with Gareth with their very own Djembe drum ensuring a community experience and an amazing sound. 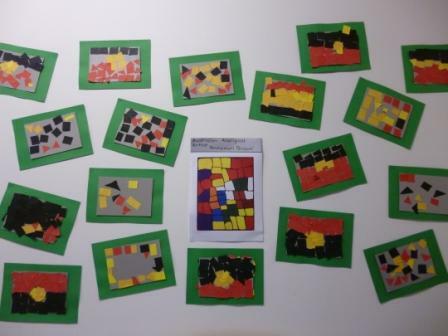 This is the second year we have engaged Gareth to work with our children – we now look forward to next year! 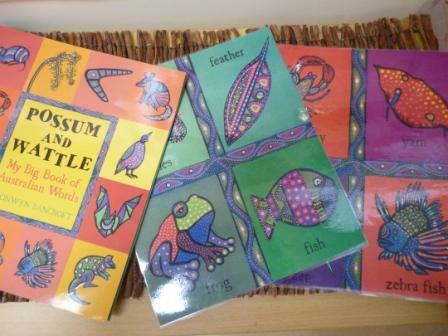 During this year’s Children’s Book Week (22-28 August) our Centre’s Preschool Seabirds’ Teacher invited children from other St Anne’s group rooms to join the Seabirds children in a ‘whole of Centre book reading experience’! The Book Week theme this year was ‘Books Light up our World’. So, with lanterns alight overhead, Fiona read a carefully chosen book appropriate for everyone, as children’s faces lit up! Taking opportunity to gather together in this way strengthens our sense of “centre community” and further strengthens our relationship with each other. With the tap-tap-tapping of the metal plates on the tips and heels of their shoes, the U3A Tappers danced their way into the minds and hearts of our Centre’s very young. The dancers’ repertoire of old favourites and their colourful costumes fully engaged the children with their eyes following the dancers’ moves across the “dance floor” culminating in some children joining in to march with them to the beat of ‘76 Trombones’.What a great sense of community we experience with such a visit! On Friday 24 July everyone at St Anne’s celebrated the Feast of St Anne. 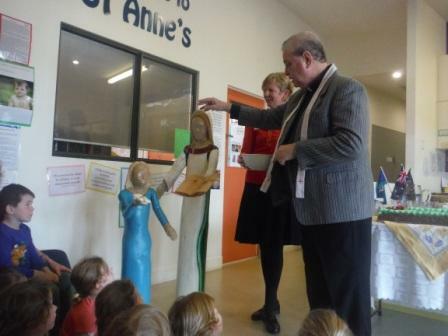 Father Michael Nilon (St Francis Xavier Parish Priest) attended to bless the St Anne and Mary statues which stand in the Cenytre foyer, skillfully crafted from timber by Mr Adam Sullivan. 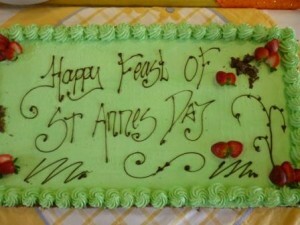 Father Michael then cut the celebratory cake which was shared with everyone. 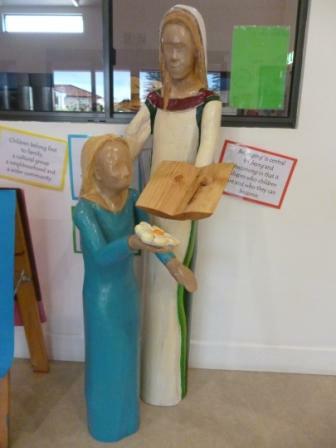 26 July is the annual feast day of Anne & Joachim, the parents of our Heavenly Mother, Mary. 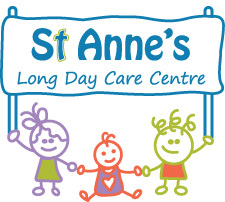 St Anne is the patroness of St Anne’s Long Day Care Centre. As the St Anne’s educators continue to support the children’s learning and knowledge of their local community and the traditional custodians of this Bundjalung country, they are leading the children through a variety of experiences through art, music and story, to celebrate the history, culture and achievements of Aboriginal and Torres Strait Islander peoples. 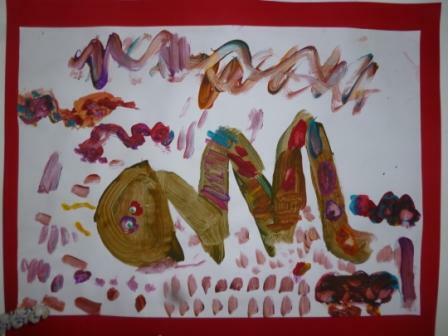 As we do this we are mindful of the Early Years Learning Framework Principle ‘Respect for diversity’: Educators recognise that diversity contributes to the richness of our society and provides a valid evidence base about ways of knowing. 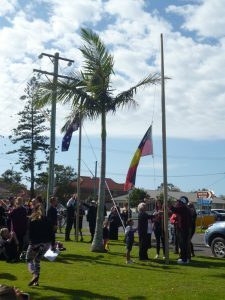 For Australia it also includes promoting greater understanding of Aboriginal and Torres Strait Islander ways of knowing and being. 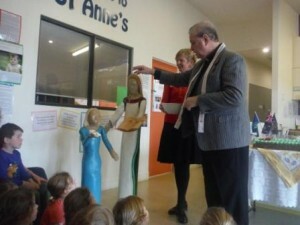 We are so very grateful to Mr Adam Sullivan (Holy Family School Assistant Principal)for his craftsmanship and generosity in making for us the statues “St Anne and Mary”. How fitting for us, for “mother and daughter “to stand humbly in our foyer.